Department of Art | Careers in Community Organizing for Visual Arts at FSU! Home » Careers in Community Organizing for Visual Arts at FSU! Careers in Community Organizing for Visual Arts at FSU! 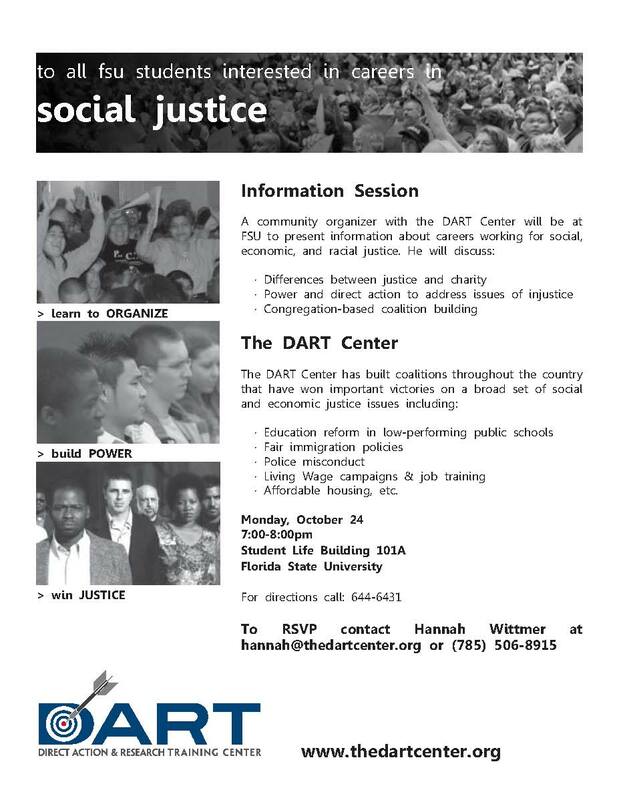 The Direct Action & Research Training (DART) Center will be on the FSU campus on Monday, October 24 at 6:00pm in Student Life Building 101A to discuss careers in the field of community organizing with students interested in empowering their communities and working for social change. Please RSVP if you are interested by contacting Hannah Wittmer at hannah@thedartcenter.org or calling 785.841.2680 with your name, phone #, email address and year in school. Although it may be helpful, no direct experience is necessary. Participants in the DART Organizers Institute must demonstrate a desire to pursue community organizing as a long-term professional career. A master’s degree, JD, or similar life experience is preferred though not necessary. Candidates must have a college degree or be graduating prior to the start of training (January 2012 or July 2012). Also, candidates must display a workmanlike diligence, be driven to produce sustained results, have proven capacity to build relationships of trust, create and execute a plan, act professionally, feel comfortable working with religious institutions, be accountable and willing to hold others accountable, demonstrate disciplined thought and action, and work in a team setting. Community Organizers must also have access to a car during their training and be flexible regarding relocation. Fluency in Spanish/English is a plus and people of color are strongly encouraged to apply.